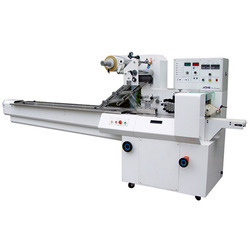 We are successfully engaged in manufacturing and supplying a wide gamut of Flow Wrap Machine. - Used for packaging purposes. - Product capacity: 60-200 bags/min. - To wrap in pillow shaped pouches. - Biscuit wrapping, chocolate bar wrapping application. - Switches packing and wrapping are done on flow wrap machine. 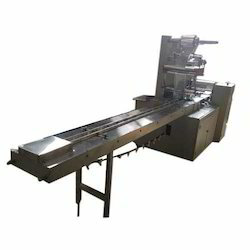 - Flow Wrap Machine is used as a Noodle packing machine in horizontal flow wrap machine concept. - Average Output: 75 TO 80 pouches per minute or as per factory set. - Packing Material: Prinyed laminates having 10 -12 barrier film with 25-50 micron LDPE layer. This machine is designed for handing the premade bags. Several hundred pieces of bags are set in bag magazine, firstly picks up a bag and feeds automatically, opens the mouth of bags, fills the products, seals the bag and discharges the packaged products continuously.